Should You Be Eating Spicy Food? The cons might outweigh the pros on this one. Here are the pros and cons for you to decide if you should start eating the hot stuff or if you can't get enough of them, to finally stop. 1. It helps you live longer. 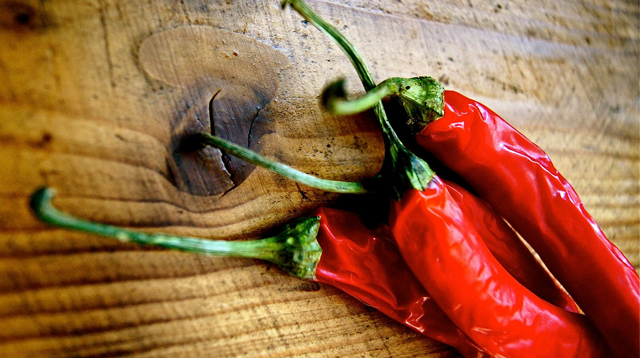 Recent research suggests that spicy food can help you live longer. They found that those who ate spicy food six or seven times a week had a lower risk of death from cancer or ischemic heart and respiratory system diseases. Their source was fresh chili. However, more studies have to be conducted to see what exactly in chili has this protective effect. 2. It can reduce body fat. Gastroenterologist Dr. Prem Chattoo says that one of the biggest benefits of eating spicy food is capsaicin. It's a chemical/hormone that can increase how much energy you use (70 to 100 calories a day) and how much fat you burn (10 to 16 percent more). In other words it increases your metabolic rate. 3. It's good for your sinuses. Spicy food like hot peppers and wasabi can help relieve sinus pressure by clearing up your nasal passages. Unfortunately not all spicy food do this. 1. It can irritate your stomach. It can cause gastritis, meaning it can inflame the lining of your stomach. That can make you nauseous and trigger fever, diarrhea, or headaches. It can also cause ulcers, giving you a burning stomach pain. 2. It can cause acid reflux. Spicy food is spicy because of the combination of spices, aka a combination of acids. Too much of it can can damage the walls of your stomach, which already has enough acid. 3. It can worsen hemorrhoids (aka almoranas). There's some conflict on how spicy food can do this, but so far the agreed upon explanation is that our capsaicin receptor is activated by the capsaicin we get from spices, and then turns our receptor into an ion channel with increased permeability to sodium and calcium ions, which in turn causes a burning pain when you try to take a dump. 4. It can worsen rosacea. Rosacea is a skin condition that causes your face to redden and produce small, red, pus-filled bumps. When you eat spicy food, it'll dilate the blood vessels under your skin, making your skin redder and bumpier.